Step #1: Plan an elaborate, multi-course menu. Creamy oyster soup for starters. 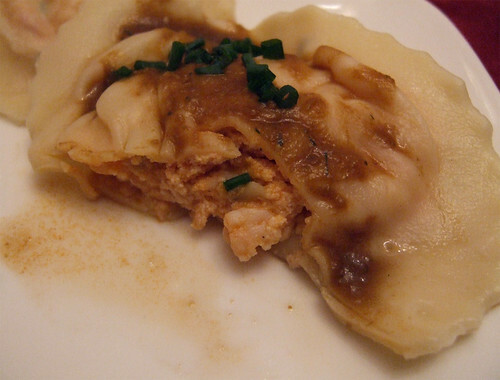 A surf-and-turf-inspired main of lobster ravioli and pork ravioli. And a dessert of chocolate pear tart. Step #2: Don't let anyone help you, no matter how much they ask. Just say you have it handled, and if they persist, give them a glaring look as you hold your chef's knife. Step #3: Don't leave the kitchen. In fact, stay there all day. To make it convenient, make a little work station at the breakfast bar with your laptop (don't forget your power bar!) and a glass of water, to keep you hydrated throughout the day. And don't sit down. Standing on your feet for seven hours will make the tired feeling even more pronounced when you finally do sit down at the dinner table later that evening. 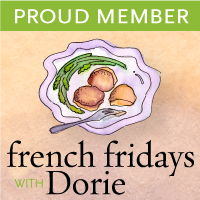 But as I've said before, I love a good challenge in the kitchen and with my family at my mercy, it's a great chance to try something new and cook something that's a little out of my comfort zone. After weeks of pondering and planning, I had wittled down my NYE menu to one that was inspired by "surf-and-turf." 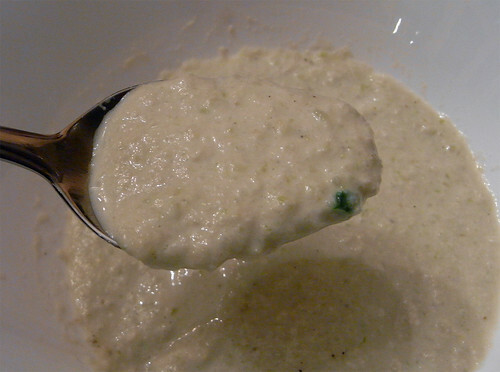 I was going to start with a Creamy Oyster Soup, inspired by a version made by Food Republik. The main was going to be a lobster ravioli (made completely from scratch!) and a venison wellington. And dessert came about from a suggestion from my brother (poached pears): chocolate pear tart. However, I soon learned that my aunt and uncle, who were visiting over the holidays, didn't eat venison. That foiled part of the plan and so I was going to be ambitious and make one version of venison and one version of pork. Yes, because I so wanted to make more work for myself! But fate was trying to tell me I was crazy while I went around town the day before the big meal from butcher to butcher, in search of some venison. My search was in vain and I went home with just the pork tenderloin instead. Perhaps that was for the best...at least for my sanity. I don't regret making the pork wellington as they came out beautifully, although the bottom of the crust started getting soggy as it rested due to all the juices of the pork that was coming out (any remedies to that? 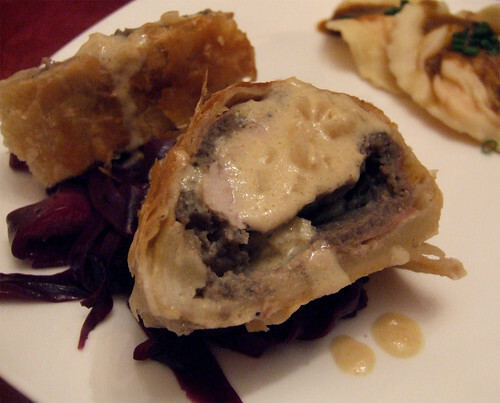 Should I have wrapped the puff pastry around the meat tighter?). However, the pork was perfectly cooked (amidst a deep fear in me that upon cutting into it, it would still be bright pink) and absolutely delicious served with a Dijon mustard sauce that I quickly whipped together right while the pork rested. The lobster ravioli, while a lot of work, were well worth it. I don't make fresh pasta very often, but when I do, I remember why it's so worthwhile to make it yourself. There's more flavour and elasticity to the dough so that when you bite into the pasta, it's truly al dente. The perfect texture for the perfect pasta. The filling was silky smooth and packed full of flavour—you could really taste the lobster, unlike store-bought versions which go heavy on the ricotta to save on costs. The sauce was incredibly rich and full of depth, due to the stock having been simmering for hours. Don't be daunted by the long recipe below. Try it. It's so worth it, even if you only make it once in your life. Oh...and if you're wondering what happened to dessert, well, after slaving way in the kitchen for almost seven hours, I couldn't muster up the energy to get back into the kitchen and bake the tart. So we went dessertless that evening (although not missed, as we were stuffed), and a rain check was issued for the tart. Firstly, steam your lobsters in a large pot of boiling water with about an inch of water. Cover the lid tightly and let steam for about 10 minutes. Remove the lobsters and allow to cool. Separate the tail from the body and carefully the remove the lobster from the shells. Reserve the tail meat in one boil, the claw meat in another, and the shells in a large bowl. Reserve. 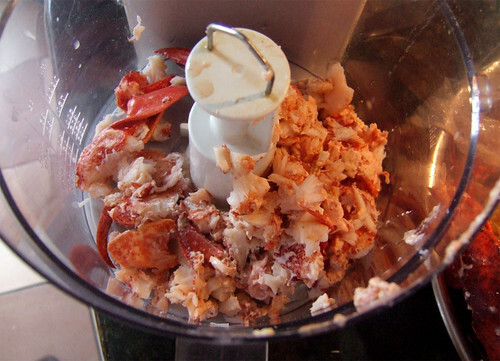 To make the filling, place the lobster meat in a food processor and blend to a fine mince, stopping when needed to scrape down the sides of the bowl. Season with pepper and mix again, ensuring even distribution. Chill for about 10 to 15 minutes. Place the lobster back into the processor, then blend in the cream, adding it in a steady stream. Taste and adjust seasoning as necessary. Cover well and store in the fridge until ready to use. In a separate bowl, stir together the ricotta, 150 g of the lobster mousse, chives, green onions and the chopped lobster tail meat until well combined. Season with salt and pepper and store in the fridge until ready to use. Meanwhile, get started on your sauce. Heat some olive oil over medium heat in a large stockpot and add the shallots and garlic, allowing them to soften and release their flavours, about 7 to 8 minutes. Add the dill, the lobster shells, tomato paste and 4 cups of water. Bring to a boil, cover and let simmer slowly for at least 2 hours. 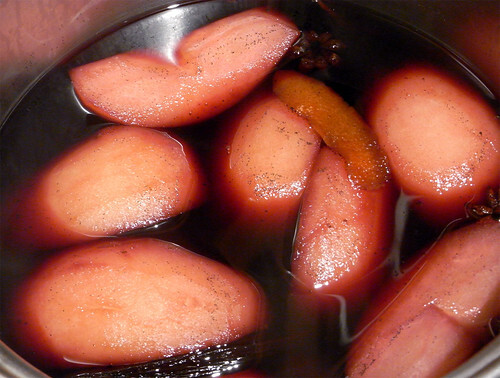 If the water is evaporating too quickly, add more water and reduce the heat a little. After at least 2 hours, you'll have a beautifully dark, brownish-orangey-red stock. Drain the stock, reserving the liquid and throw out the shells. Return the stock to the pot and continue to reduce by about half, or until it starts to thicken. Add the cream and season with salt and pepper, stirring through. 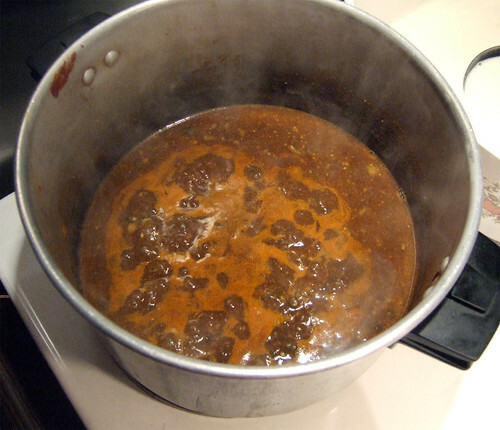 Bring to a light simmer and turn down the heat, keeping the sauce warm until ready to use. Take out your prepared pasta dough from the fridge. I like to work the dough in several batches so that it's manageable and your dough doesn't dry out. Dust your work surface with some flour, take a lump of pasta dough the size of a large orange and press it out flat with your fingertips. 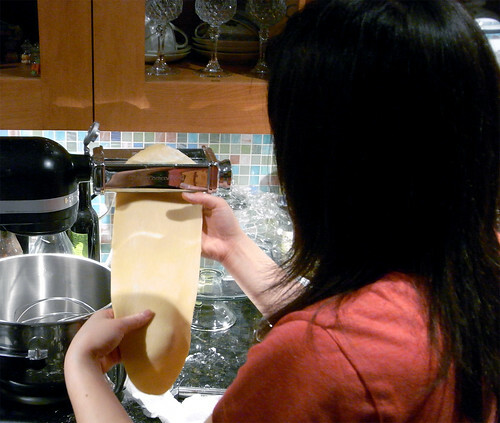 Set the pasta machine at its widest setting (1) and roll the lump of pasta dough through it. Lightly dust the pasta with flour if it sticks at all. Fold the dough in half width-wise and feed the dough into the pasta machine again, this time perpendicular to the rollers (so that the fold-side is going perpendicular and not parallel to the rollers). I like to roll my dough through each setting twice. 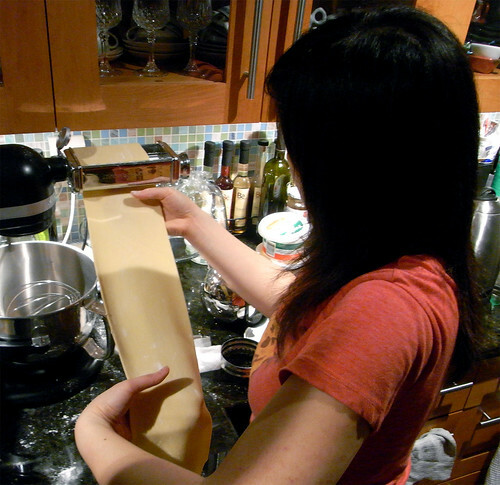 Click the machine down a setting and roll the pasta dough through and repeat again. Continue with this rolling process until you've rolled through setting 3. By now, your pasta sheet will be fairly long, so I like to cut it in half to make it easier to handle. Continue to roll each sheet through the machine until you've rolled through setting 5 (my preferred setting for the ravioli...not too thick, not too thin). Square off the dough with a knife if you'd like. If your dough starts feeling a little sticky at any point throughout the rolling process, just dust the whole sheet with some flour on both sides before you feed it through the rollers again. 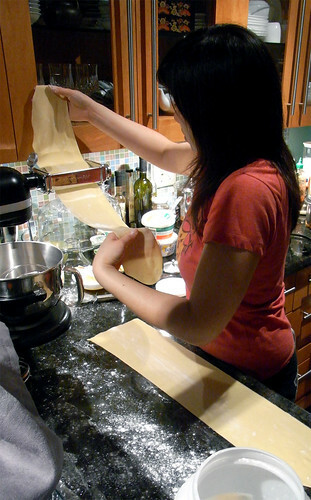 Lay the two sheets of pasta on the countertop. 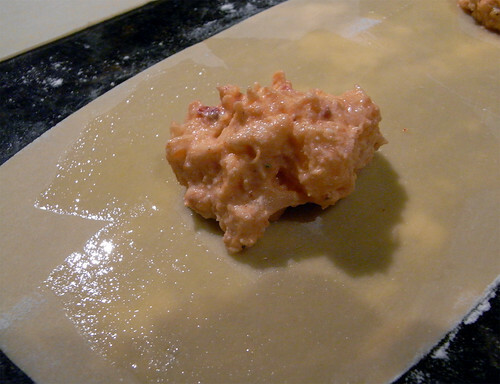 On the bottom sheet, spoon a heaping tablespoon of the lobster filling into the centre of the dough, leaving about 2 inches of space between each filling. Using a pastry brush, lightly brush the egg wash around each filling. Carefully take the other sheet of pasta and place on top of the sheet with the filling, pressing down around each filling to seal and press out any air that may be trapped. Using a circle cutter about 3-inches in diameter, cut each ravioli out (you can also do this with a knife for square-shaped ravioli). Place the ravioli on a well floured baking sheet and cover with a tea towel. Repeat with the remaining dough and filling. When a tray of ravioli has been filled, if using fresh, then cover with a tea towel and wrap the baking sheet in plastic wrap. Store in the refrigerator until ready to use. If freezing for a future use, wrap the baking sheet in plastic and place in the freezer until each individual ravioli is frozen. 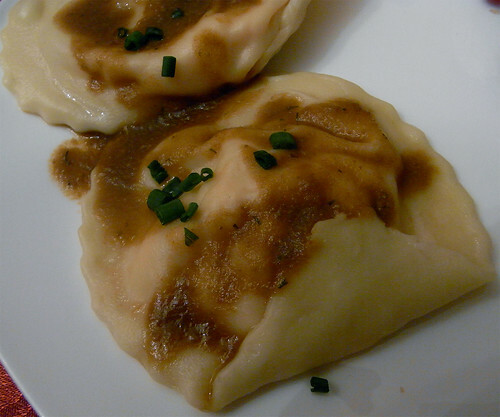 Carefully remove the ravioli from the tray, place them in a freezer bag and return to the freezer. The ravioli can keep frozen for up to 1 month. Bring a large pot of well-salted water to a boil. 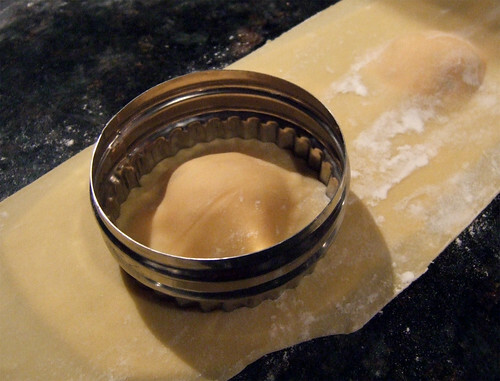 Place a handful of ravioli into the pot, making sure you don't overcrowd the pot. 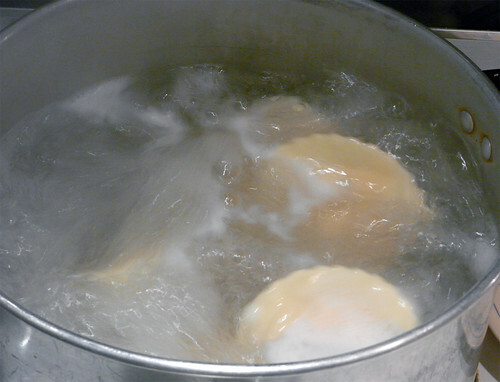 Boil for about 3 to 4 minutes, or until the ravioli start to float. Remove the ravioli with a slotted spoon, making sure to remove any excess water, and serve immediately, drizzled with some of the warm lobster cream sauce and garnished with some dill. Danielle January 11, 2011 at 9:26 p.m.
What a gorgeous meal!! Congratulations! Bonita January 12, 2011 at 7:48 p.m.